Fans of Shakespeare, buckle up! The first folio, a printed collection of William Shakespeare’s work dating back to 1623, is coming to Madison. The folio will come from its home at the Folger Shakespeare Library in Washington D.C. Madison is a stop on its tour called “First Folio! The Book That Gave Us Shakespeare.” This tour marks the 400th anniversary of William Shakespeare’s death, which is commonly accepted to be April 23rd. The first folio will be displayed in the Chazen Museum this fall, from November 3rd through December 11th. The Chazen is one of the few museums in Madison able to meet the temperature, humidity, and lighting demands of this old document. 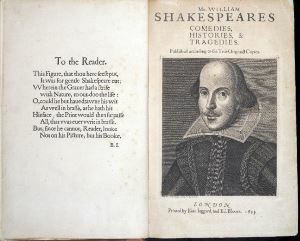 While on display, the folio will be open to the page bearing Hamlet’s famous soliloquy “To be or not to be.” The museum’s goal is to show that Shakespeare’s works continue to be performed and are still popular. Admission to the exhibit is free. The First Folio was printed seven years after Shakespeare’s death, and there are 234 copies of it known worldwide. In fact, the discovery of a copy of the First Folio was even recently found on a small island in Scotland. The Folger Library owns 82 copies. Also a teacher at Appleton High School, Parker is currently testing a curriculum integrating Shakespeare across several subjects, in order to drive home the ongoing legacy of the playwright’s work. As he suggests, we often use Shakespeare in our everyday life without noticing it. For example, how many of us have heard “to be or not to be”? Or, have you used the term “breaking the ice”? Though you might not know it, many of our common phrases today come from Shakespeare. Shakespeare’s plays are very popular and still widely performed today. Their relatable themes, including love, perseverance, and greed, hold messages that still ring true even after so many years.